Let me start today's post by sending a great big thank you to Kim and Nancy for sending photos of their pups. 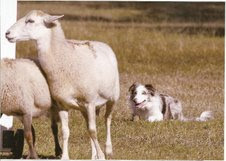 Kim's Border Collie, Pounce, is seen doing his "job" of herding in the photo above. Isn't that just a perfect name for a herding dog?!! Wish our school kids could concentrate that well! Last week I got a big surprise when Tanner and I received word that he is being "promoted" to the next level of Agility classes. We're so excited! I'm sure I'll make a complete fool of myself next week at the first class, but then, I can laugh it off. After you hit my age, these embarrassments aren't such a big deal any longer. Oliver, my younger dog, will remain at level 2, still having a long way to go to catch his big brother. That's good though, as trying to train them both in the same level was a tougher challenge than I had anticipated. I'm giving myself permission to digress a bit today. As you may have noticed, I added advertising to this blog. It was quite a dilemma deciding whether I should jump in or not, yet. In the end, I wanted the blog to offer opportunities for dog lovers to shop for things they can't find at their local pet supply shop. For instance, my mother lives in a small town where there is just one small shop. You either buy it there or drive a long way to find it. I have found better buys online and often do my shopping that way now. So, I guess that's the reason I took the plunge. I supplied a search box for Amazon in the sidebar, to make it easy to find things. I hope you find some of this helpful, and will offer your thoughts via comments or email at LetsAdoptaDogPark@gmail.com . Speaking of Adopt a Dog Park, National Clean Dog Park Awareness Week is coming up soon. Feel free to pass this info along to other dog lovers. I welcome park adoptions from anywhere, and would love to receive photos of your dogs at your favorite park. When you write to me to adopt a park, I will gladly display your dog(s) photo on the website. I'll be here Wednesday talking a bit about discipline and food aggression. This is a topic that has been requested, so I will take a stab, offering what I know on the subject. These are times when I wish Cesar Millan were here to help me through. It's okay, though, my guys are really good examples of this skill. Thank goodness! Although I am no expert, my 3 are well mannered dinnertime companions who know how to wait for permission and "take it" when given that permission. Join me Wednesday for some photos of dinnertime in action at my house. Also on Woofing Wednesday at Organic Journey Online, Oliver will make an appearance in a photo with my mom and her organic orchids. They are spectacular!